It’s a Thursday morning in New York City. I arrived from Florida on Monday and saw Hamilton Tuesday at the Richard Rodgers Theatre. To say this has been a dream come true is like saying people in New York City have style—gross understatements. The film is called Dream, Girl. Everybody’s underrated until you’re not. With six words he presents what, to me, in this moment, feels revolutionary: the idea that maybe when you feel stuck—those moments when you’re not getting ahead, not getting the opportunities you feel you’re ready for, or feel you’re working under your potential—it doesn’t always mean there’s something wrong with you. What if when your hunger feels greater than your opportunities it isn’t a sign you’re doing something wrong but a sign that you’re being underrated, ignored? Does it also mean being ignored is a sign you aren’t any good? What if when we think we’re not good enough we’re really just underrated? I hold the thought close and continue getting ready for the premiere. I finish packing my purse, walk the 15 minutes to The Paris Theater and find a spot in the huge line of beautifully dressed people in front of the long, bright red carpet. Inside, I’m embarrassingly thrilled to see popcorn bags waiting for us. I try to resist grabbing two and choose an aisle seat in the third row of the 600-person theater. Not too long afterward every seat is filled save two near the front. Then film director Erin Bagwell and producer Komal Minhas walk in and the crowd erupts in applause and a standing ovation. Erin and Komal laugh. I can tell they don’t even know what to do with this moment. “Ever since I was a little girl I wanted to make a movie,” the film begins, and in an instant I am no longer in a theater in New York City. I am Erin. I am Annie. I am Komal, Mariama, Clara, Joanne, Marie, Alicia, Linda, Suzanne, Crista, Jess and Amanda. All the women in the film. I am them. They are me. That is the power of film. These women featured in the film are working hard for the simple privilege of being able to work in a way that allows them to share the best of themselves with other people. They are vulnerable. They are successful. And they don’t apologize for either. Being these women for an hour and a half awakened something in me that I didn’t even know had been quieted. In getting to be them for an hour and a half, I became more me. And what I loved most about the film was something I would have never guessed: a simple choice Erin made. She filmed these women at work, doing their job. But in this film, watching each woman in her daily grind is the most remarkably un-boring thing about the film. You see 83-year-old Clara Villarosa, now working on her third business, the publishing company Villarosa Media, at a table with her daughters discussing the right cover that will sing from the shelves for one of their books. Then there’s Annie Wang of Senvol, a 3D printing company, who you see talking to her partner about whether or not they should take on an unpleasant client because of the money it will bring in or say no, thank you. And then there’s Komal, boss of her own media company, Skyping one of her first employees. Any woman who has ever tried to do more than what is expected of her will see herself in these moments, in the daily decisions required to move an idea forward, in what it looks like to put yourself and your ideas on the line, each and every day. Watching these women at work was as empowering as watching Hamilton. Dream, Girl reminds me of something that I sometimes have a hard time holding on to: Where there is a lack of role models, a lack of representation, a lack of diversity, it is not due to a lack of talent or ability—it is a symptom indicating the sickness that occurs when an entire group of people have been severely underrated. That’s when we all lose. Dream, Girl not only showcases a diversity of entrepreneurs, though. It also emphasizes the diversity of character and personality traits that can make up a successful entrepreneur. Vulnerability, for example, is lauded in the film as an entrepreneurial strength, not weakness. And the women in the film are nothing if not vulnerable. Not only in their work, but also with the stories they share, the kind I’m used to only hearing in quiet conversations amongst a handful of trusted friends—the kind I rarely hear blown up on a giant screen in an audience of 600 people. They talk about personal sexual harassment experiences in the workplace. The kinds of things you feel in your stomach or in the heat of your face, but often hide because you don’t want to sound like you’re making excuses. The things that, deep down, you’re still not even sure are real; if you’re allowed to feel violated or if you’re just being “sensitive,” not “tough enough.” If maybe this discomfort means you aren’t cut out for this. I can almost feel the collective release of tension when these stories are told, as if the silent stories in the theater are rising up into the air at the same moment, reveling in the confounding elation that comes when someone tells you that that violated feeling is real, and wrong, and that it’s OK to speak it out loud, even on a big screen. As the women speak about these moments in their lives, I am transported to the ones in my own, and I want to cry in joy as I realize that the worst part of feeling ignored is never actually being ignored—it’s being made to feel like the invisibility and its scars are all in your head. Annie Wang of Servol talks about how when some businesspeople come up to her and her male co-founder at events and ask a technical question, they always look to him to answer. When she answers, because she is the more technical one in the partnership, they still look to him, waiting for his response as the final say, the “real” expert. She talks about the small details, too, how they don’t even turn toward her when she speaks. They continue to face him. The angles of bodies that communicate worth, things you often feel in your stomach before you ever catch them with your eyes. These stories and so many more make me feel less alone. Less crazy. Like more is possible. Like we can be all of the things, even the things that the people who angle away from us can’t see in us—yet. The film’s first step in helping its viewers move forward in a space that is their full potential is simply acknowledging that the closed doors are real—and that not all the doors that slam in your face are slamming because you’re not good enough. 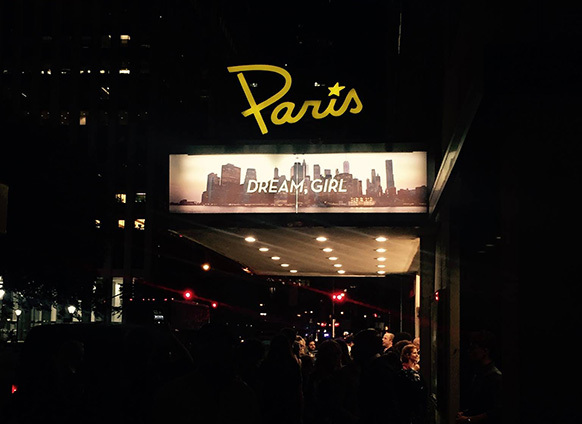 You can watch Dream, Girl for free today right here!